Much like the Fine Cooking Italian cookbook, the Taste of Home Cooking School cookbook was very simple, colorful, and easy to read. The recipes were easy to comprehend, easy to execute, and just in case there were any issues, the cookbook is full of mini tutorials, like how to stuff chicken. This one was super simple to make and it went perfectly with a little grillout that we had. As most of my readers know, I am a huge buffalo fan. I'm sure it surprises no one that I made a buffalo recipe :) This one also has bacon in it. Buffalo + Bacon = A win in my book every single time! Another bacon recipe! I liked that creamy sauce and the crispy bacon and green onions together. These were GREAT! They are rolled in butter and coated in seasoned bread crumbs. They are stuffed with cheese and green chiles. There was a little margin instructional on how to do roll ups right next to the recipe that came in handy! I have been craving tacos and fajitas and all kinds of delicious Americanized Mexican food. This really hit the spot. You use ground turkey as well, which I've been trying to do more often. Clearly, it's a healthier alternative to ground beef. This was my first time making homemade baked beans and I tell you what, I could eat these every single day of my life and I could never get enough of them! Three different kinds of beans, molasses, ground beef, and bacon made this recipe out of this world! I've been eating dried fruit and nuts in yogurt, oatmeal, etc. Basically anything that they could be added to, I've been adding them to! I really liked the idea of making krispie treats with nuts and berries and they were very good! Taste of Home: Cooking School gets 5 utensils from me! I am hoping to get my hands on a copy soon because there were so many recipes in it that I want to try. If you like the food you see on my blog, you'd definitely love this book. If you are a beginner in the kitchen or you like visual aids, this cookbook is for you! 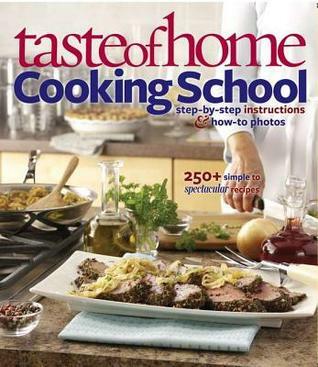 A special thank you to NetGalley and Reader's Digest for the opportunity to review this cookbook!